Tartan is a pattern of criss-crossed horizontal and vertical bands in alternating bands of colours. It is woven in such a way as to produce visible diagonal lines where different colours cross, which results in the appearance of a new colour. The resulting blocks of colour repeat horizontally and vertically in a distinctive pattern of squares and lines called a sett. 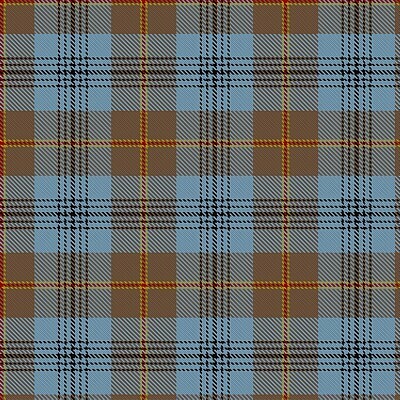 In North America, the terms "tartan" and "plaid" are interchangeable, but in Scotland, a plaid refers to the woven tartan cloth. The Falkirk Tartan is the earliest surviving example of Scottish cloth. Dated from somewhere between the first century B.C. and the third century A.D., it is composed of two different hues of undyed yarn woven in a herringbone pattern. It was discovered at Falkirk in Stirlingshire, stuffed into the mouth of a clay vessel that contained almost two thousand dated Roman coins. Tartan as it is known today most likely appeared in Scotland in the sixteenth century, where numerous references can be found to striped or checkered plaids in the literature of the period. By the early eighteenth century, tartans could be used to distinguish the inhabitants of different regions, as the setts and colours of the various tartans varied from isle to isle. Patterns were originally associated with regions rather than clans or families, since they were produced by local weavers who used what natural dyes were available to them. It was common for Highlanders to wear a number of different tartans at the same time, and patterns did not begin to become standardized until the eighteenth century. In 1725, the government battalions of the Highland Independent Companies adopted one tartan to avoid an association with any particular region; this became the regiment's official tartan when it became the Black Watch in 1739. The traditional manner in which a soldier could distinguish friend from foe was through the ribbon in his bonnet. Until the middle of the nineteenth century, the Highland tartans were associated with regions or districts rather than specific clans, since tartan designs were produced by local weavers who used the natural dyes available to them. Before organizations and families began adopting certain tartan patterns to represent them, people simply wore the patterns that were most to their liking. 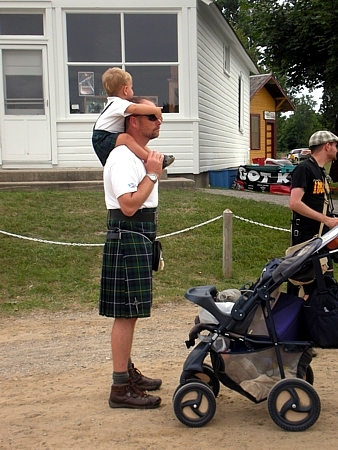 While the tartans fell out of fashion during the middle of the eighteenth century after they were banned by the Acts of Proscription, Highland societies began promoting "the general use of ancient Highland dress" after the acts were repealed in 1782. 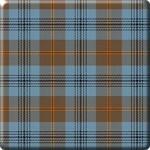 The naming and registration of official clan tartans began in 1815 when the Highland Society of London resolved that all clan chiefs each "be respectfully solicited to furnish the Society with as Much of the Tartan of his Lordship's Clan as will serve to Show the Pattern and to Authenticate the Same by Attaching Thereunto a Card bearing the Impression of his Lordship's Arms." Eager to participate, many chiefs provided the Highland Society with "official" samples even though they had no idea what their family or clan tartan might be. 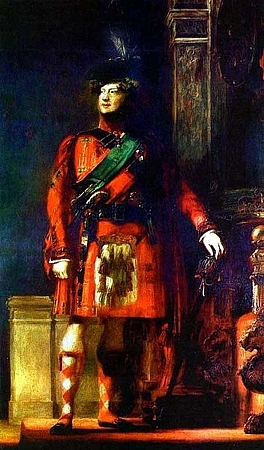 For example, Alexander Macdonald, 2nd Baron of Sleat, was so far removed from his Highland heritage that he wrote to the Society: "Being really ignorant of what is exactly the Macdonald Tartan, I request you will have the goodness to exert every Means in your power to Obtain a perfectly genuine Pattern, Such as will warrant me in Authenticating it with my Arms." The Highland Romantic revival that culminated in King George's 1822 visit to Scotland brought a sudden demand for tartan dress through the whole of Scotland. 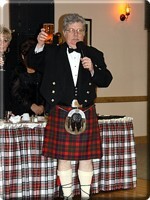 The highlight of the trip was a grand Highland Ball, hosted by the peers. Invitations requested that all guests don ancient Highland garb for the occasion, since the king would also be wearing a kilt. Thus Lowland nobles frantically scrambled to find some distant Highland ancestry so that the tailors in Edinburgh could craft them suitable tartan kilts for the ball. 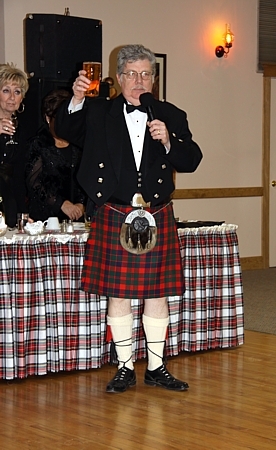 No longer limited to the Highlands and isles, the tartan kilt was elevated from primitive costume to national dress almost overnight, now signifying clan, rather than regional, affiliations. Following the Royal visit, several books appeared to document tartans. The Vestiarium Scoticum, the first publication showing plates of clan tartans, appeared in 1842. Written by a man who claimed to be the grandson of Prince Charles Edward Stuart and Princess Louise of Stolberg, John Sobieski Stuart, the book purported to be a reproduction, with colour illustrations, of an ancient manuscript of the clan tartans of Scottish families. Despite the fact that the book was denounced as a forgery shortly after its publication, it generated a great deal of enthusiasm for clan tartans and paved the way for a number of similar books. Twenty years after her uncle visited Scotland, Queen Victoria and her husband, Prince Albert, made their first trip to the Highlands. The couple was so delighted with Celtic design that when they bought Balmoral Castle in Aberdeenshire in 1848, Prince Albert decorated its entire interior with huge swathes of tartan. For the carpets he used the red Royal Stewart and the green Hunting Stewart; for curtains and upholstery he employed the Dress Stewart. The Royal couple spent a great deal of leisure time at their estate, where they hosted many "Highland" activities. Victoria dressed her children in kilts and surrounded herself with pipers while Albert developed a passion for the Highland Games. During the Victorian and Edwardian era, tartan shifted from being mainly a component of men's clothing to become an important part of women's fashion as well. 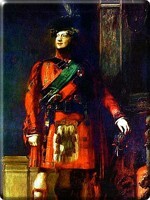 Because of its association with the aristocracy and the military, tartan developed an air of dignity and exclusivity. The Burberry check, for example, was born in the 1920s, and has become instantly recognizable around the world as a symbol of sophisticated, refined fashion. Tartan also made a resurgence in the punk fashion movement of the late 1970s. By wearing the tartan in an unorthodox and ironic way, British youth expressed their discontent with modern society and transformed it into a symbol of anti-establishment. 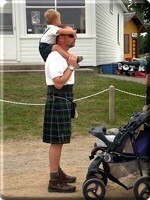 Today, the clan tartan is an important emblem of the Scottish clan. 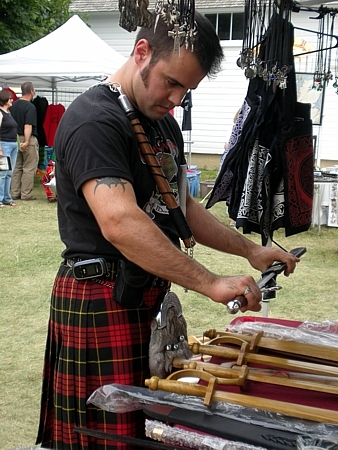 Almost all clans have several tartans attributed to their name, and many have official tartans. 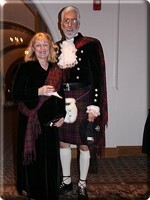 Although anyone can create a tartan and name it anything they wish, only a clan chief can make an official clan tartan. In some cases, the clan tartan is then recorded and registered by the Lord Lyon King of Arms, the Crown minister responsible for regulating heraldry, who would then record it in the Lyon Court Books. 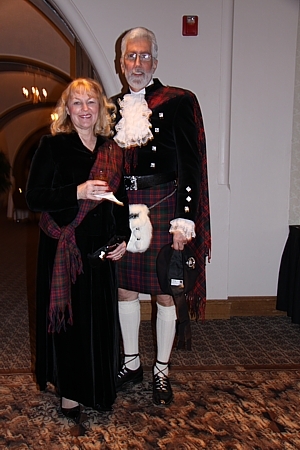 Tartans can also be created for individuals, families, institutions, corporations, events, and more. Many military units, especially those within the British Commonwealth, utilize tartan in their dress uniforms. 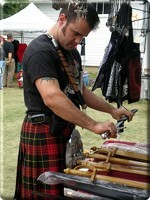 British Parliament created an official tartan registry in 2008. The Scottish Register of Tartans, maintained and administered by the National Archives of Scotland in Edinburgh, aims to provide a definitive and accessible resource to promote and preserve tartan while serving as the definitive source for the registration of new tartans. Its original database was composed from the registers of the Scottish Tartans Authority and the Scottish Tartans World Registry, which had respectively compiled 3,500 and 3,000 tartans.